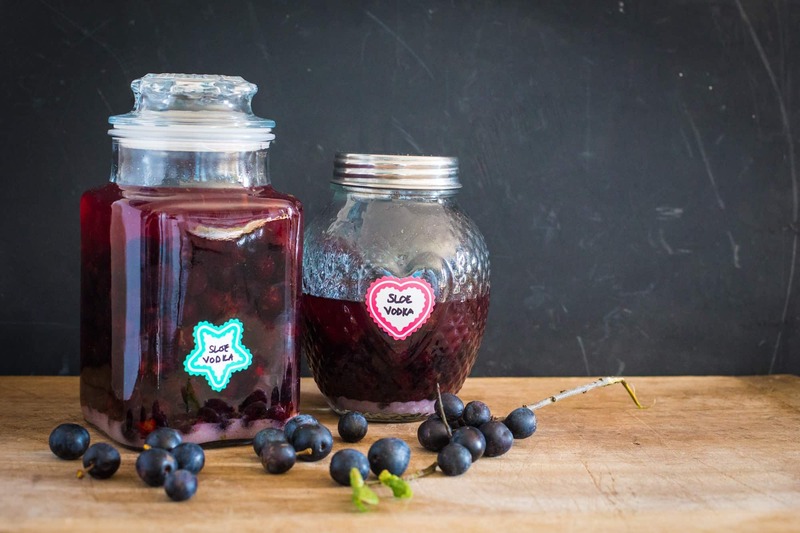 Fancy sipping some homemade Sloe Vodka this Christmas? It’s such an easy tipple to make, and the perfect homemade gift to give to your favourite people. This homemade Sloe Vodka is growing my stash of home grown booze a treat! My blackberry flavoured vodka is still in the brewing phase, although it is now ready to strain (and taste test!). And whilst our blackcurrants were an epic failure this year, I did still manage to lay down one lonely bottle of my homemade blackcurrant cassis for the darker months. There’s something very oldy worldy about cracking open a bottle of a hedgerow brew that you picked yourself to share with loved ones on a cold winters night. And keeping the best bottle from each batch, till dusty and forgotten is the ultimate foragers tax. So, in case you want to brew up a batch of this homemade slow vodka yourself, the recipe couldn’t be any easier. There’s probably a reason not to use those wrinkly imperfect fruit, but I gather them all. Or at least all that I can reach. Then you need to combine them with vodka and sugar for about a month. Then strain and store in sterilised bottles where they will sit happily until you can bear to break into your stash! Sloes are part of the plum family, so inside that black skin with a whitish bloom, you’ll find an orangey yellow flesh and a single flatish stone. Freeze and/or prick the sloes to allow the juice out. Pile into one (or more) sterilised glass jars. Tip in the sugar, pour in the vodka and stir a little. Pop the lid on tightly and store somewhere cool and dark, stirring/shaking occasionally. After 2-4 weeks, strain off the vodka and seal in sterilised bottles. The alcohol content means that it will keep indefinitely. I remember my aunt used to pick sloe berries to put in alcohol. I’ve never tried making any myself but would quite happily drink it! I’ve had such a lovely sloe gin that a friend made. I really must try making your sloe vodka! Great video. This vodka looks absolutely gorgeous (and I’m sure it tastes amazing too!). I never tried making it myself, but it’s definitely got to try it soon! 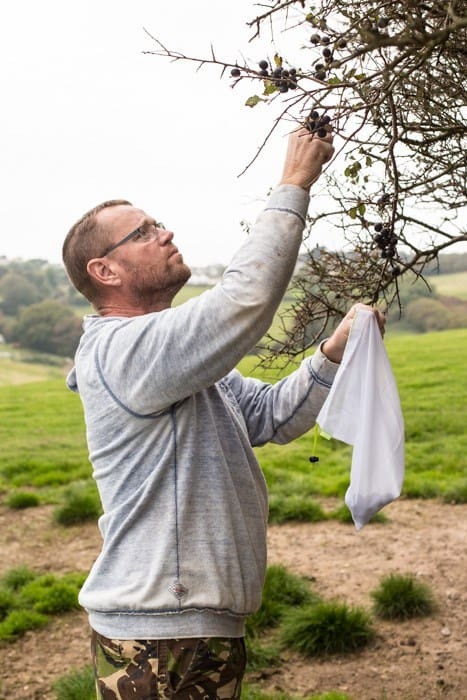 I have never made my own booze but am inspired by your post and I shall be looking out for sloes which I’ve no doubt walked passed without knowing! With the cooler weather approaching, I could certainly warm up to this liquid jewel! Great tutorial on making your own Sloe Vodka! It looks awesome! Yum! Love that this drink came from berries that you picked! I really like the sound of sloe vodka but every year I always make sloe gin…maybe I should make both this year…you know, just for quality purposes. I’ve never heard of this before but I would love to try it. Been making sloe vodka for 5 years now and it is an easy tipple to make.truely unique taste and a smooth drink. Hard to beat on a cold winters night huh?! I started my sloe vodka on 30th October but have just been reading that I should have kept in a cool dark room. I have had mine away from the window in my kitchen as I wanted to be able to see it to remind me to shake it. Have I ruined it? I was so looking forward to putting it in little bottles and giving as Christmas presents. I would be very grateful for your views. Hey Steve! Honestly, you’ve got me there. I’m going to guess on yes, as honey is used as a preserving agent like sugar, and the alcohol will offer more preserving powers. However if anyone knows any different please let us know? And Steve if you try it – would you let me know how it goes? Made a bottle blackberry vodka and a bottle of sloe gin. Blackberry vodka is lovely, haven’t cracked the sloe gin open yet, made both in October 2017, using your recipe. Have just put a sloe vodka to marinate, hope it’s as good as the blackberry. Thanks for the recipe. I’m in central France and this year the hedgerow fruits have been overwhelmingly fantastic. I’ve got a couple of litre’s of Sloe Vodka and Sloe White Rum on the go. Only got a couple of litres of each as funds run out before the fruit did. This is the first time I’ve tried sloes with white rum. Hope it turns out OK.
Also got Damson Rum and Damson vodka so we’ll be set up for Christmas and (hopefully) well into the New Year.